Cake Batter Chocolate Bark couldn't be easier—or more delicious. 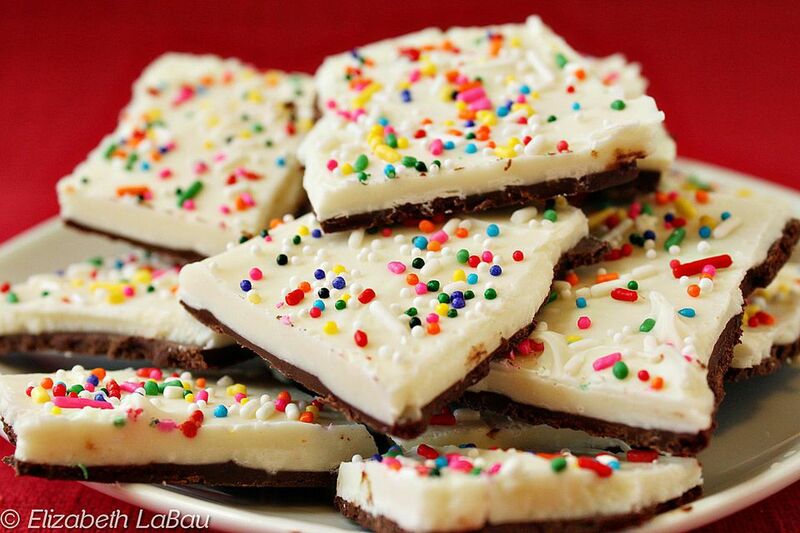 A simple white and dark chocolate bark is flavored like cake batter and decorated with colorful sprinkles. I like the contrast of the thin dark chocolate layer underneath the white chocolate-cake batter layer, but you can omit it or make it thicker to suit your tastes. Place the chopped dark chocolate or chocolate chips in a bowl and microwave until melted, stirring after every 30 seconds to prevent overheating. Once the chocolate is melted and smooth, pour it onto the prepared baking sheet and smooth it into a thin, even layer, less than 1/4-inch thick. Refrigerate the tray to set the chocolate while you prepare the white chocolate layer. Melt the white chocolate in the microwave the same way you melted the dark chocolate, stirring frequently so it doesn't overheat. Once melted and smooth, add the dry cake mix and whisk or stir until the mix is completely incorporated and there are no lumps in the chocolate. Taste the chocolate and add a bit more cake mix if you want a stronger flavor. Allow the white chocolate to cool until it is just barely warm. Once the dark chocolate layer is set and the white chocolate layer has cooled, pour the white chocolate over the dark chocolate and spread it into an even layer. Scatter sprinkles over the top and press on them gently to adhere them to the white chocolate. Refrigerate the tray until the bark is completely set, at least 20 minutes. Once set, cut it into small squares or break it into pieces by hand. Store Cake Batter Chocolate Bark in an airtight container in the refrigerator for up to two weeks.